So school started today and believe us every hour felt like a month - know that feeling?? Today we decided to take our pictures once again at the beautiful lake in our lunch time! That awesome little blue house is right next to the bellevue and a lovely restaurant.. and it's perfect to take pictures in front... agree? Anyways we will see you in our next post, it's all back to normal! So in love with your outfits! i love your style and your sense of fashion! I waiting for you to me! Neon for this spring is a big thing and adore your post! Great inspiration for me and gorgeous photos! What a beautiful place! I absolutely loved all the accessories you both used on these outfits! So cute! Love the colors in these photos! Nice look! I love supergan! Lots & lots of love for you! adorable photos girls! the restaurant by the lake looks sooo cute! 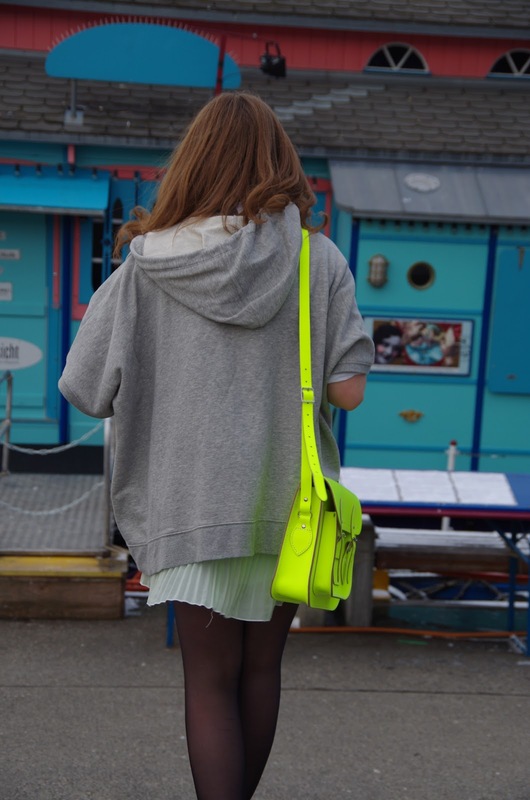 Love the boathouse its so cute and the yellow bag is great combination with the outfit.Great pics guys! Really liking how you accessorized these looks! And loving these sneakers, supergas are my favorite, and nikes are my husbands so great picks! Love that bright green bag. It's quite the statement. These photos by the lake are gorgeous! Love all of the bright colors! Love the boathouse! Your outfit is lovely. I love the bright neon yellow bag! Just found your blog, I'm now following you! Your looks so nice guys!! Hi girls! I've awarded you with Best Blog. Take a look at my blog! Both of you look amazing. I love the watch and the statement necklaces. The neon satchel is such a wow factor. Gorgeous!! that place is very cute. You two look great! Thanks so much for your sweet comment! So nice! I'm loving the neon satchel! Such a fun color & will be so perfect in spring! Love all the bright colors!! And your pictures are great! Love both of your bags and both your jumping shots look great. I love that necklace too!!! love both of your accessories :) the jumping pics were too cute ! OMG I love the neon satchel bag and how you stack the layer of necklaces together! Love the fluo bag ! You guys are simply adorable! Wooow, amazing! You are sooo pretty, girls! Thanks so much for a lovely comment on my blog! Do you want we to follow each other? Just let me know on my blog!